Another week has passed and it has been strangely quiet. 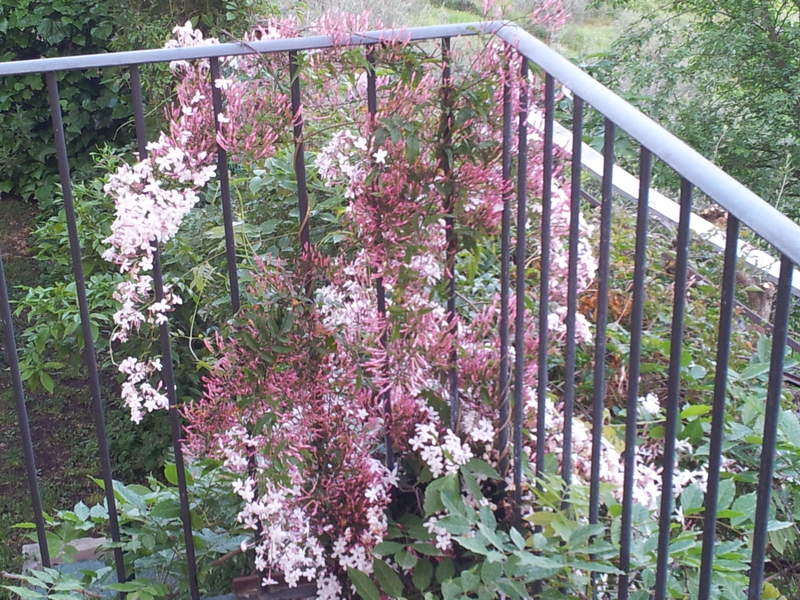 My man remarked one evening that, ‘One could get bored looking at this fabulous view every day, breathing in the scent of Oleander, Jasmin and Dry Grasses. Wandering around the garden and orchard, checking on the fruit trees including apricot, plum, fig and cherry. Picking a strawberry here and there, watching the courgettes grow, greeting the swifts as they swoop over us in the evening sky. And then there’s the flocks of snowy white Egrets gracefully flying through the valley below us, the arrow formation of geese cruising from one lake to the next and the toads contentedly croaking in the swampy bits on the valley floor.’ He sighed deeply. ‘Perhaps we should take a holiday’ I say trying to cheer him up. ‘Possibly, but where shall we go?’ he groans. ‘Mmmm, perhaps we should think about it over our delicious espresso in the cafe bar tomorrow morning.’ I suggest. ‘Buon idea’ he says. ‘Would you like to go out and eat tonight instead of waiting for me to cook?’ I offer. ‘What for? Eating here in this beautiful spot is better than any ristorante in the area, and we are looking down over the vines that produce the Chianti we love to drink!’ He remarks. ‘I agree, maybe it’s the fact that you decided to give up drinking yesterday that you are feeling this way today’ I say carefully. Silence. Back at Laura’s alimentari/bar in Fiano, everyone is very cheerful again and in particular Sig Rotund who is now looking very tanned having possibly gone to Il Mare (The Seaside) for a couple of days, whilst there were no papers to read. This morning, a favourite widowed Signora of ours brings in a puppy chihuahua, which was a surprise birthday present from friends, as they felt she needed ‘la compania’. Naturally we all fuss over it, however, we wonder how something so small can really be called a dog! We always had big dogs that could swallow this little mite in one! Last week I told you about our discovery that the Cicada was not the insect we thought it was! I have since read up on this amazing creature and as we already know they are incredibly noisy during the summer months. In full voice the male and his friends can create a din as loud as a Rock Band or Jet Engine! Right now they are all around us in the tall pines and cypress trees. Did you know that some species of Cicada have a penchant for disappearing underground for many years and as long as seventeen? 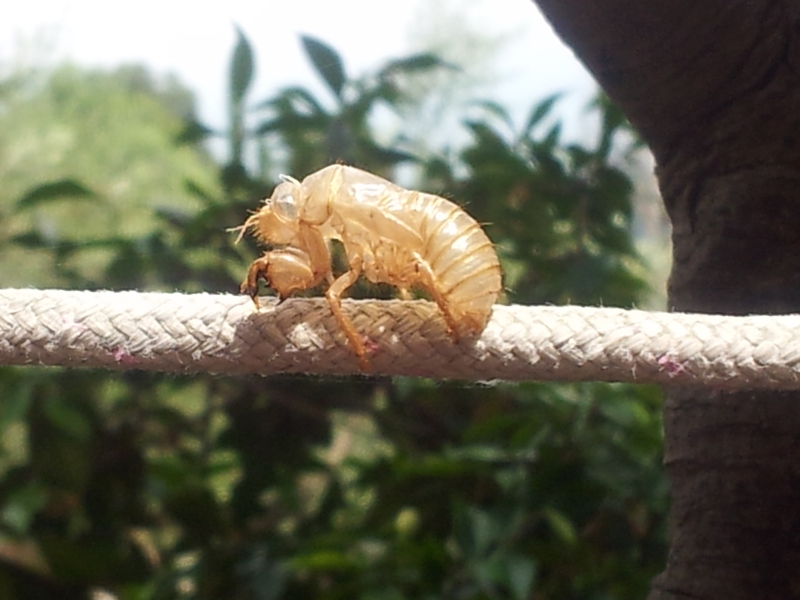 We also now know, that the strange ghostly looking outer skins of an insect, that are found all over the trunks of trees and the washing line, had been left by the Cicada! Amazing…. 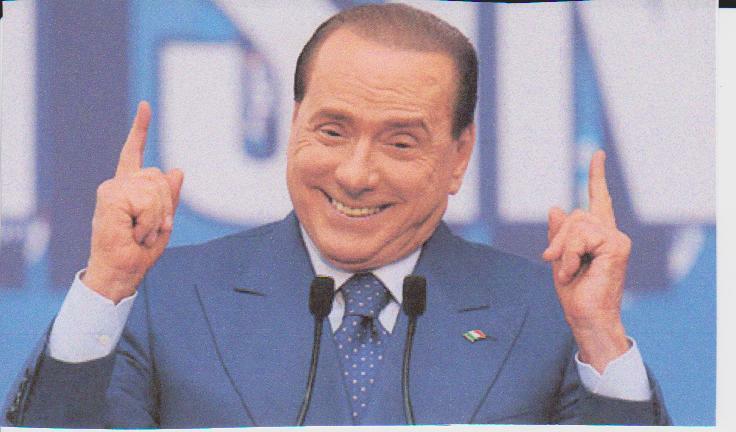 Silvio shows how he can hold the country together with just two fingers! 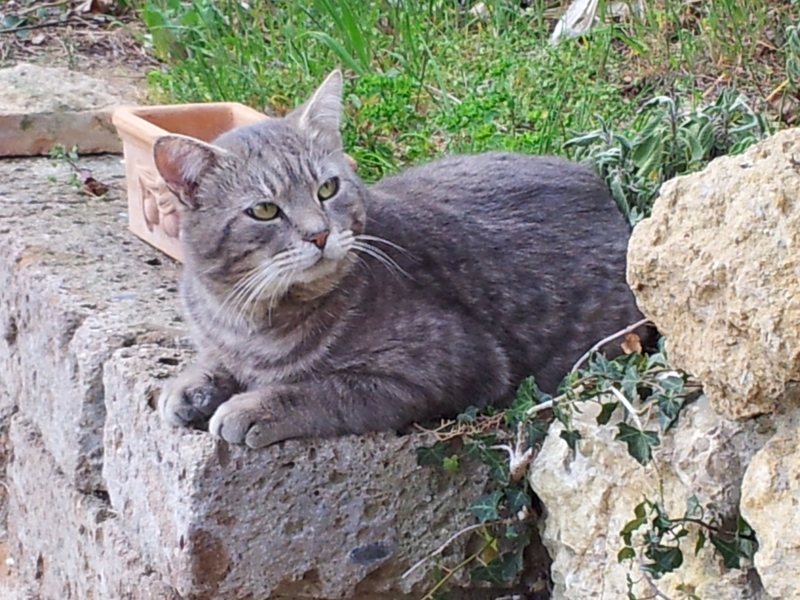 And so to Silvio. It would be a very sad day should the short, yet larger than life, Silvio Berlusconi, cease to be in the news. We and our friends in the local bar firmly believe that his political enemies have all got it in for him. Echoes of Kenneth Williams crying ‘Infamy, Infamy, they’ve all got it in for me!’ The latest news indicates that it would be folly to throw Silvio out of the political arena because he is very rich, keeps the status quo and is hugely popular. In the meantime our hero is considering passing all his business interests over to his daughter…..
We managed to catch the elusive Farty Barty on saturday morning and get him to the vet for an inoculation. Being a six-year-old male cat, he is terrified of losing his vital bits, however, so far we have rightly or wrongly let him keep them. My man is not feeling so benevolent about the squirrels that are still hitting him with sharp half eaten pine cones. He is considering sending them back with a catapult. I think he just needs a glass of Chianti. 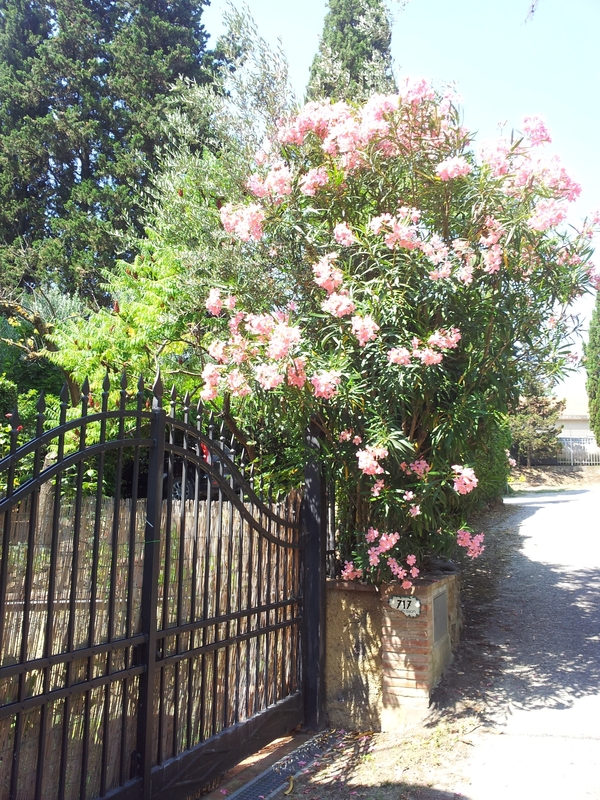 Well, must go and enjoy lunch at ‘C’era una Volta’ in Luccardo near Fiano. PS – To read or leave a review of my novel, click top right of this page – ‘My Father, The Assassin’. yes, it’s also amazing how many people go down with an illness on holiday. It’s as if the body recognizes and attempt to relax and the natural immunities drop away! Nearly forgot, thanks for mentioning me on twitter!